Hi Everyone! Wow it's been awhile since I've blog. Apologies, I'm working on so many projects now and it's taking all of my time. If you follow my social media, you'll know what I've been up to :D Today I want to share my experience with Citicars. I was approached to try their services and even though I don't know much about cars, I was excited to give it a try since my car was in dire need of servicing. Plus, when I looked up the place, their branches are actually located at popular malls, meaning you can have your car service while in a mall. I love the idea, I think the concept is so cool. I couldn't believe there's such thing, I assumed car servicing places are suppose to be, well, huge and wouldn't be able to have a location especially in malls or in malls' car park. If I didn't go there myself, I wouldn't believe it. 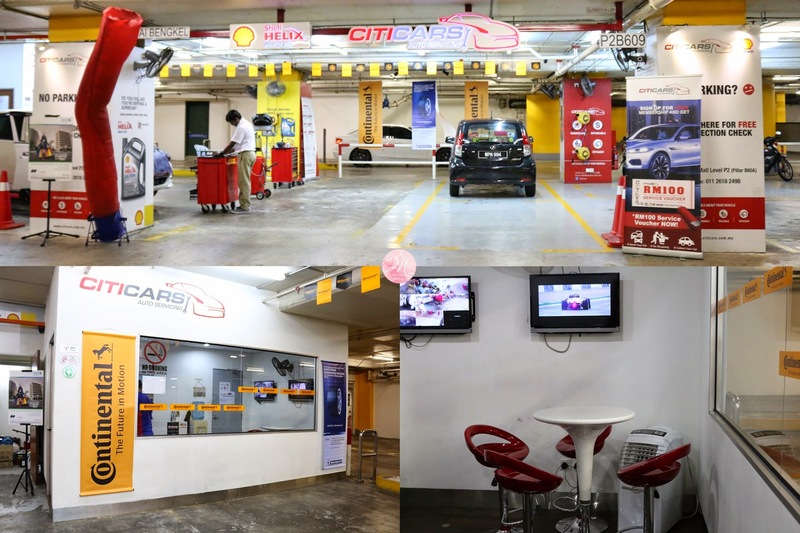 "CITICARS is a first of its kind Malaysian origin new concept of lifestyle vehicle service, tyre and repair centre where we bring the “need” of the consumer to a shopping mall’s car park! Just send in your car for service, go shopping, dine, go for a movie, buy your groceries or simply enjoy quality time spent with loved ones in the shopping mall and conveniently drive home safely in your fully serviced and reliable vehicle." It's more or less just a check up. And as I mentioned earlier, my car was in dire need of service. So after an inspection, they told me there were a couple of things my car needed. I didn't know what it was even though they explained it, I couldn't explained it back. What I like about this type of service is that they showed me what they found, what they said needed change/fix etc. I didn't get this first hand experience with my usual servicing place, which was at Perodua service centre. Usually they just said what they'll be doing on paper and I don't know exactly what it is. But here, they really show me the parts that they are checking. They even changed my brake pads and showed me the difference between the new one and the old one, which I appreciate. So, here's my advice, if you're like me, please bring along someone who knows about cars with you during servicing. I don't think they cheated, but I also think they took a slight advantage of my lack of knowledge about cars. So to avoid any drama, bring someone along with you. I'll give you their price so you can compare it to other servicing centres. These are only some of the things I did for my car, I'm not going to list them all, some are just car parts I left out like bulbs etc. The total price that was quoted to us was RM779.50, while I usually just paid around RM 200 - 300 at a Perodua service centre. Granted at Perodua they probably didn't do all the services I stated above before. But I still didn't expect that it would be double the amount. Neither did my dad, that's why he was angry. So I review this service with a mix feeling. I'm not saying it's bad, I'm saying just bring someone with you. I can't emphasis that any harder! Just use the code above to get the promotion. Call first to make an appointment, because not all of their outlets have this service. I'm a freelance Makeup Artist from KL, Malaysia. Follow my journey through my love for all things beauty. Hi! My name is Farisha Nadia and welcome to my humble blog.